vacancies in this Punjab PSPCL Recruitment are 853 posts. Candidates interested for PSPCL Junior Engineer, LDC/ Typist jobs have to go through the official website www.pspcl.in. Online application forms for the PSPCL Recruitment starts from 18-12-2017. Last date for submitting PSPCL application forms is 08-01-2018. Candidates will be selected for 853 PSPCL Junior Engineer, Sub Station Attendant, LDC Jobs is based on written examination and Interview. Minimum age limit of the candidate is 18 years and maximum age limit is 37 years. More details of Punjab State Power Corporation Limited PSPCL Junior Engineer, Sub Station Attendant, LDC/ Typist 853 Govt Jobs recruitment Application form procedure, Qualifications, Pay Scale, Selection process, Age limits are mentioned below. Total available vacancies in this Punjab State Power Corporation Limited PSPCL Recruitment Notification are given below. Total no of vacancies: 853 posts. 2. Sub Station Attendant: 253 posts. Candidate must have completed Graduation Degree or equivalent qualification in concerned discipline from recognized University. See the PSPCL Notification for other qualifications. Salary for these JE, LDC, Sub Station Attendant Jobs is admissible as per govt norms. 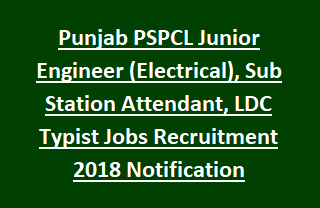 Selection for this Punjab PSPCL Junior Engineer (Electrical), Sub Station Attendant, LDC/ Typist Recruitment is based on candidate merit in written examination/ Interview. See the PSPCL Notification for other selection procedure details. Please go through the PSPCL official website for Application fee related details. Interested candidates having above eligible criteria have to go through PSPCL official website www.pspcl.in. Application forms for PSPCL Recruitment JE, LDC jobs available from the same web portal. Online application submission starts from 18th December-2017. Last date for submission of applications is 08-01-2018.